A patented pneumatic sand classifier design is presented. Its diagram is given, and operation described. Jan van Wijk discusses the wet, thermal and mechanical reclamation processes required in the face of enhanced environmental regulations, the high costs of dumping and the increasing scarcity of high-quality bentonite. Results of investigations into solidification of an Al alloy with 1.5% Fe in magnetic field and under exposure to electric current are given. It has been shown that treatment of the alloy with electromagnetic field during solidification makes it possible to produce castings with a homogeneous, fine-grain structure. Formation of fine-grain structure at the edge of a sample casting, and concentration of non-metallic inclusions and gas holes in the center is noted. Key words: aluminium alloy, inoculation, electric current, magnetic field, directional solidification, microstructure. Capabilities of prototyping process for making molds, cores, lost-foam patterns are discussed. It is suggested that this promising method should be applied in the production of dies for low-pressure die casting. 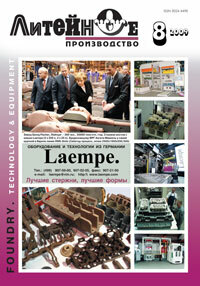 Key words: computer tomography, 3D image, low-pressure die casting, thin-wall castings. Enhancement of heat resistance of investment casting shell molds contributes to casting quality improvement and cost reduction. In c e r a m i c s h e l l (CS) production, quartzcontaining materials are often used as a slurry filler and a cover material. However, such shells have a lower heat resistance. Replacement of quartz sand with different materials having no polymorphic transformations will contribute to enhancement of heat resistance of shells, improve dimensional accuracy of castings, and reduce casting rejects. It is shown that ash from heat electropower stations has the most suitable characteristics for CS production. Key words: heat resistance, ceramic mold, polymorphic transformations, heat capacity, linear expansion, quartz sand, ash from heat electropower station, blast furnace slag. It is suggested that master alloys should be made by centrifugal casting. Investigation of master alloys made by that method showed the possibility of obtaining in them a finer grain than in those made by the conventional method. Key words: master alloy, fine grain, centrifugal casting, cooling rate, intermetallism. Formation of shrinkage cavities in composite castings made by vacuum impregnation method was investigated. Advices for minimization the head of casting has been worked out. Key words: composite casting, shrink hole, riser, volume fraction of melt, effective composite temperature. The ratio between the temperature of casting material's transition from plastic state to elastic state and the temperature of material crystallization is suggested as a criterion of material's cracking resistance and tendency to warping in castings. Key words: casting, cracking resistance, warping, temperature, shrinkage, material, criterion.